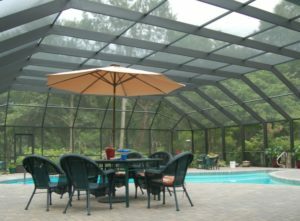 Patio enclosures provide homeowners in Pooler, Georgia, with a way to enjoy their outdoor spaces all year long. Imagine being able to relax in your backyard or enjoy time with family and friends without having to worry about pesky insects, harsh sun, or inclement weather ruining your day. At Porch Outfitters, we’ve helped countless homeowners make this dream a reality by installing top-of-the-line patio enclosures that offer decades of exceptional performance. If you’d like to bring the outdoors in and enjoy beautiful views without leaving the comfort of your home, then a sunroom is ideal for you. Sunrooms are fully enclosed with glass walls to flood the space with natural light and provide panoramic views. We’re proud to offer TEMO sunrooms, which have thermal roofs and premium glass systems, which makes it easy to keep the space comfortable all year long. Screen rooms are perfect for homeowners who want to enjoy the fresh air without having to deal with mosquitoes and no-see-ums. At Porch Outfitters, we install custom screen enclosures with premium vinyl-coated screens that are extremely durable and will keep even the smallest insects out. These enclosures are perfect for a patio or around a pool. No matter what type of patio enclosure you’d like for your home, you can trust Porch Outfitters to provide an exceptional quality installation. Our team consists of our own full-time employees – not subcontractors – who have been thoroughly trained to ensure flawless results. Contact Porch Outfitters today to learn more about the patio enclosures we install at homes in Pooler, GA. When you do, ask about the same-as-cash financing options we offer.